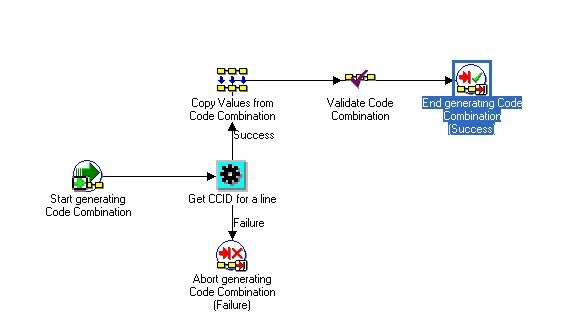 Every Organization has different need based on business requirement; recently I need to give a demo to my customer about how to customized COGS workflow to derive the Cogs account. With all the above option we can derive the COGS account from any one of these options or with the combination of all these. In my Demo I have selected Oracle Vision Accounting Structure where Accounting KFF has 5 segments. Rest 3 segments from revenue account associated with the Sales Rep.
Below is how I have customized the COGS to fulfill my clients requirements. 1. 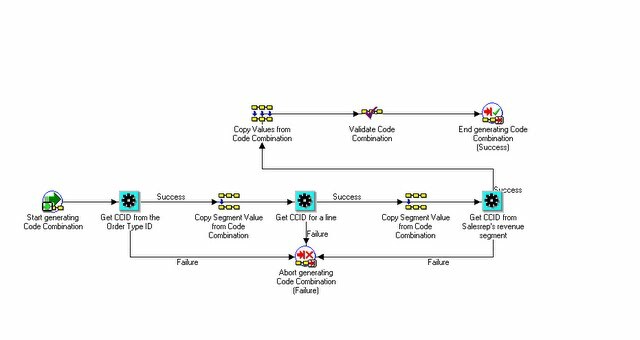 Create the copy of the exiting workflow ( for question on workflow refer my earlier posts). Segment = Company (Case Sensitive Value). 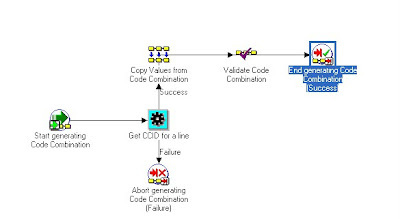 CCID for a line as shown in Pic( Modified flow). Segment = Department ( Case Sensitive Value). 6. Drop the “Get CCID from Salesrep's revenue segment” . derived from Step 3 and 5 and Segment3/4/5 from the setp6, so I set Replace Existing value = False. 9. Join all workflow notes as shown in modified flow pic. 12. Verify the flow and save in database . 13. Run cogs_11i.sql for both 11i/12i and verify the account generated by the workflow.